Days of Our Lives (DOOL) recap for Friday, April 12, 2019, reveals Ciara Brady (Victoria Konefal) feels it’s unfair that Ben Weston (Robert Scott Wilson) can’t get to know baby David. Ben reminds Ciara that a lot of people in Salem still see him as dangerous. Ciara tells Ben that she told Eli Grant (Lamon Archey) that the lighter Ben had at the cabin looks a lot like the one JJ Deveraux (Casey Moss) found in Claire Brady’s (Olivia Rose Keegan) jewelry box. Ben and Ciara go to his place to spend time together. 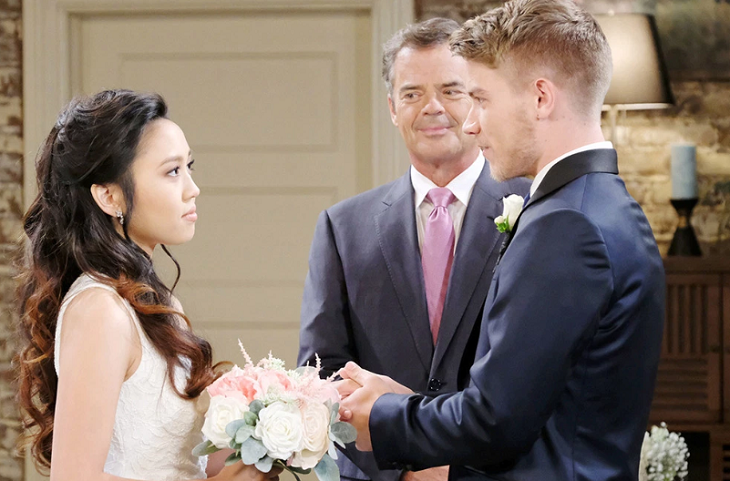 Ciara doesn’t want to go home because Tripp Dalton (Lucas Adams) and Haley Chen’s (Thia Megia) wedding is taking place there. Ben invites Ciara to stay at his place. Days of Our Lives Claire has confessed to Eve Donovan (Kassie DePaiva) that he set the fire that almost killed Ciara last years. Eve promises not to turn Claire into the police but to frame Ben for the attempted murder. Eve wants Ben to pay for killing her daughter no matter how she has to make it happen. Claire tells Eve she is worried that Tripp will fall in love with Haley and cannot let that happen. Days of Our Lives Jennifer Horton (Melissa Reeves) gives Jack Deveraux (Matthew Ashford) a choice, he can stay with her and figure out his memory, or he can marry Eve. He realizes they had something special, but he doesn’t feel it anymore. Jack pulls away from Jennifer and leaves to meet Eve for their wedding. Jack meets Eve and fills her in on Jennifer’s kidnapping; Eve tells Jack that Eric helped Jennifer. Jack decides marrying Eve is the right thing to do and they proceed with their plans. Adrienne offers to perform the ceremony, Jack reluctantly agrees but stops the ceremony after having flashbacks of his conversation with Jennifer. Jack and Eve turn their wedding into a political rally and talk about Abe Carver (James Reynolds) supporting Haley’s marriage to Tripp. Jack and Eve claim their marriage is based on love. Adrienne has let Jennifer in on her plan; she seems to be trying to sabotage the wedding. Justin agrees to marry Tripp and Haley before leaving the hospital. Back at the loft, Haley and J.J. are making out. Agent Laverne Smith arrives and assumes Haley is dressed for her wedding. The agent wonders why J.J. is there, Haley says they made amends since he is family. The agent starts quizzing Haley about Tripp’s likes and dislikes to try and trip her up. Claire and Tripp arrive at the loft, and she questions him about his feeling for Haley. Tripp is unaware that Claire is taping his confession of love to her and that his marriage to Haley is fake. Tripp goes inside, and the wedding begins. Claire comes back and interrupts before they are pronounced husband and wife.